Using my many swamp studies and my detailed drawing I have created an underpainting for a new painting. I pushed myself not to just get the feel but to try to get as much information as I felt necessary to read swamp, fog, quiet and a heck of a lot of mystery. I did a detailed drawing on the board before applying paint. Sadie's blog talks a lot about surfaces so check that to learn more. For this one I am painting on a gesso board that I sanded and am painting with turpentine and transparent brown oxide (instead of the raw umber and ultramarine blue I used last week.) 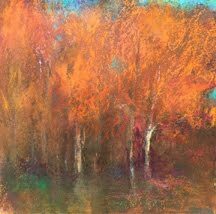 Landscapes need a warm underlayer. The effect is much like the monochromatic watercolor underpaintings I sometimes did for pastel. I was VERY careful when painting the edges. Decisions about edges are made last. If you make sharp edges in an underpainting it's hard to lose them. Ooooh, this grisaille looks different from your other grisailles. I'm intrigued and looking forward to seeing your painting progress. Also, transparent brown oxide is something I've never tried. Beautiful start. It could stand on its own as a lovely painting! Hi Donna, It's good to hear from you. Still in Frederick, or have you moved? As for warm underpaintings, yes I always prefer it. I believe it helps the landscape breathe. 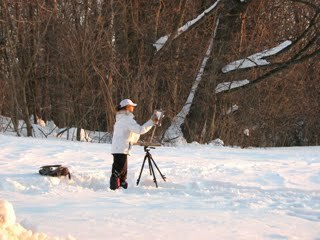 As for your question about winter, yes I would still paint warm. You might adjust that to a warm purple or a sort of warm pink. Experiment and see what you like. Anytime I use cool underneath for a landscape I do not like my painting. That's just my experience. No absolutes. Hi Janelle! Thanks for noticing. Transparent brown oxide(WN) is a color I bought about a year ago. I like its watercolor like feel. Let me know if you try it. I really appreciate your generous sharing of what you learn! Very often, you write something exactly when I need that very reminder. Richard's workshops, Casey's Colorist, and your great posts are keeping me mindfully on track. And yes, your swamp is beautifully spooky. The sling came off today!!!!!! Only have to wear it in crowded places. What a relief! 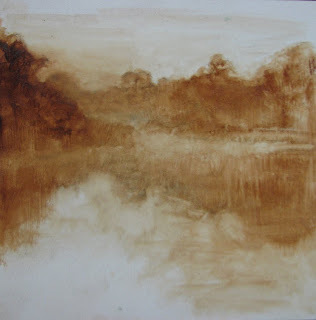 This is a beautiful underpainting! I would hang it just the way it is. It has beautiful character and values. Can't wait to see the finished version. Nice to be back, I've missed writing to my friends. Now that I can type with both hands, you'll be seeing more of me around. The arm is still very stiff and weak but it's coming around. More PT to come, at least now it's in the strengthening phase. How are you feeling now? Meds working out? P.S. Following your cue about a warm underlayer for landscape, I assume a warm ground helps. Yes? The reminder about edges is appreciated. P.P.S. Welcome back, Doug; congrats on slinging the sling! Now I'm wondering how you'll layer this beauty. Many thin ones, or a few direct ones? Or, is that asking too much of the process? YAY!!!!!!!! Look caps included in your writing! Great news...ding dong the sling is dead! Welcome back! I missed you...you were missed by many. Keep going to your PT and work hard. Thank you about the underpainting. Yup, warm is good and edges are key! I think it will be a mix...all will be thin. Can't wait for my paints to return! thanks about the grisaille! Yes, it is different! I can see all the information here, as well as feel the 'feel'. I also agree that it could stand on its own, so I'm really curious about what will happen! Hi Loriann. 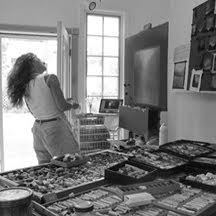 I am happy to see your work with Sadie has you back in the saddle in drawing and underpaintings with attention to drawing and edges. Looking forward to seeing how it develops. Sadie seems like a lovely person-she contacted me yesterday on Facebook about taking my workshop next year. I hope I get to meet her one of these days. Paint on! Are you still in Florida? I am glad that you can see the differences. I, too, can't wait to see what happens. It feels good to be back to doing more drawing, not just my usual thumbnails.I was really surprised (being a new englander at heart) how much I really enjoyed painting the Florida landscape. I think I will go back there sometime soon just to paint landscape. Sadie a lovely person. I know she would enjoy your workshop.